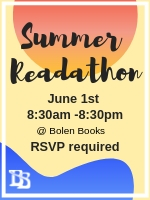 Bolen Books is excited to announce our upcoming, 12-hour Readathon! Participants will collect pledges from sponsors for each hour of reading they do in-store on June 1st between 8:30 am and 8:30 pm. 100% of funds raised will go to support literacy awareness and the Victoria Literacy Connection. Readathon participants will be eligible for in-store giveaways throughout the day and prizes provided by HarperCollins Canada. Whether you’re asking a single donor for $5.00 per hour, or looking to find a larger list of sponsors, the event is sure to be a great way to support child literacy in Victoria while helping children improve their reading comprehension skills. If you want to take part in this readathon or have any questions, please send your RSVP/inquiries to bolenspecialevents@gmail.com.